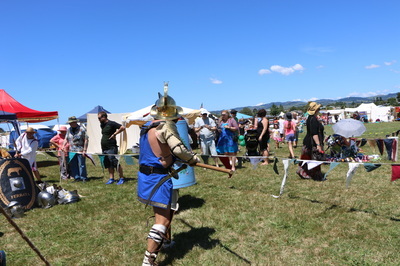 The three-day Tauranga Medieval Faire ran from Friday to Sunday under a glorious summer sun where we constructed a Roman display camp of legionary tents to showcase all of our Roman equipment and gladiator gear. 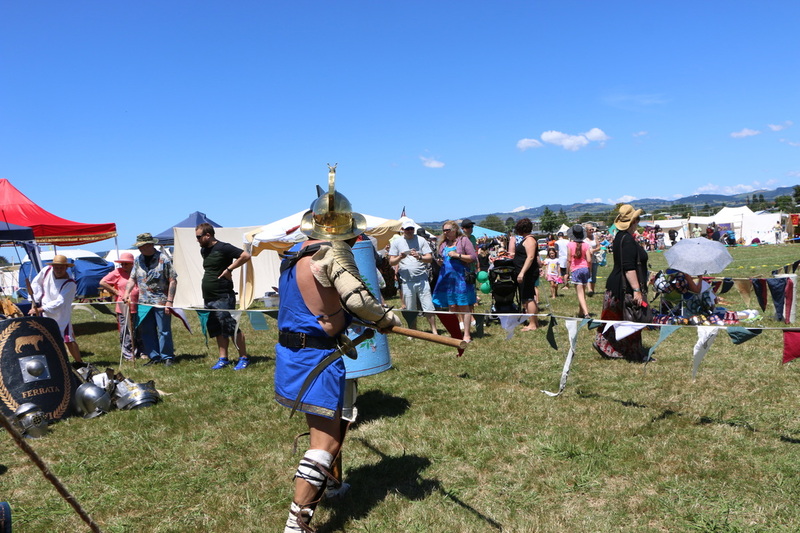 We gave demonstrations of gladiator fighting styles and a Roman drill display and parade for the public's entertainment and education. Our gladiator fight on Saturday pitted Lucius the Damned fighting as a giant Murmillo versus Decebalus the Dacian, fighting as an agile Hoplomachus. The arena was first blessed by the Priestesses of Fortuna to bring our gladiators luck, and the Imaginifer holding aloft the bust of Jupiter so that the gods might witness the proceedings. The obliging gladiators walked around the edge high-fiving the audience, as it is very good luck indeed to touch a gladiator. Their fight was fast and furious, but when the Hoplomachus lost his spear due to a brilliant shield thrust by the Murmillo, the rudis referee halted the melee, much to the Murmillo's anger, and ordered the Dacian to go take up his native weapon, the Dacian falx, since after all the whole point is entertainment, and the huge crowd roared their approval. The Murmillo was right to be aggrieved, because the skilled Dacian employed his falx to devastating effect, driving the huge Murmillo to his knees forced to raise his finger in missio (mercy), the sign of surrender. The baying mob voted for life or death, and although it was a close run thing, those connoisseurs of fighting-skill in the audience just managed to tip the scales in favour of life for the determined valour shown by the Murmillo so that they could enjoy watching him fight again tomorrow. Rome is hard, but it is always fair. There followed the Ludus Noxii fight between Blythe the Celt, Idunna the Gladiatrix, Jorkellus of Germania, and Drest of Parts Unknown. This fight resulted in death for all except Idunna, whom the merciful crowd voted "Life!" New recruit Mitchell Green trains as a giant Murmillo gladiator by fighting Martin Layzell armed as a nimble Thraex wielding the wicked curved sica sword angled to stab around shields. The crowd was fascinated to have the rare opportunity of taking a behind-the-scenes peek of how these men train with real steel weapons and the finer points of technique not readily apparent in an arena show. Being up-live and close with the opportunity to ask questions really satisfied many members of the public. The Roman camp attracted a lot of interest. 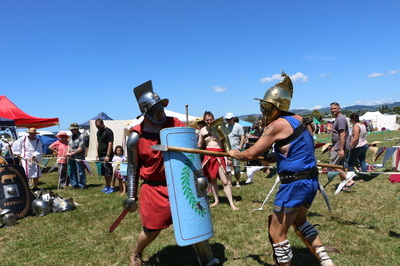 It included two legionary tents, a display of Roman military gear, some of which the public could try on, and there were always Romans present to demonstrate fighting techniques and answer the many questions. We also expanded the civilian display of Roman scrolls, and devices of everyday life. And the new military standards headed by Eagles looked great "flying on watch" over the camp. Pete Rogers fighting as a Retiarius with net and trident training Mitch fighting in style of Murmillo. The Retiarius having both range weapons makes for a very different match up due to the speed and agility that he needs because of his scant protection from sword blows. Martin and Pete demonstrate the gladiator fighting styles of the Retiarius against the Thraex. Pete swings his weighted-net and demonstrates how a skilled fighter can aim to break bones or hook the legs, besides trying to completely envelope his foe. The trident is a similar range-weapon to the spear, and he also has a knife for close quarters fighting. The Thraex must consistently elude the casts, and block the trident with his shield, while seeking to close in with his sword. The audience sure cheered when the Retiarius sent the Thraex crashing to the ground! They then swapped roles, as Martin first trained as a Retiarius many years ago, and the old fox still had a few tricks. The secret of the Roman army's success was - drill, drill, and more drill. And then drill again. 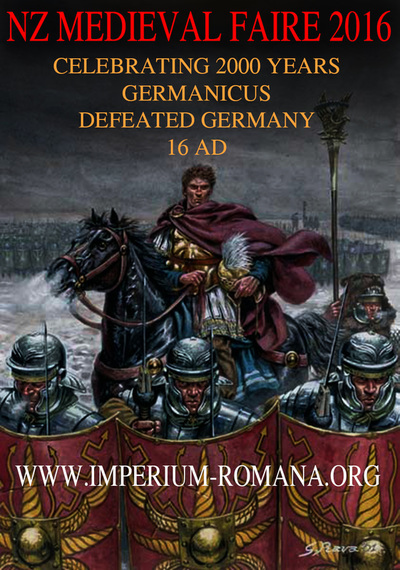 We formed up on the field to execute just some of the many complex battlefield maneuvers employed in Roman war campaigns, before heading on a parade march to the front gates singing our Roman marching song: "Da mihi gladium... Legio Sextus Ferrata!". Martin gave Mitch a run-through of all the main gladiator styles, so here we see the spear of the Hoplomachus searching for an opening behind the big Murmillo shield. Fighting a range weapon like a spear is a lot different to swords, and Mitch needs to work his way close enough to nullify the Hoplomachus' advantage and make a strike. The Hoplomachus also carries a short sword for close quarters, but here Martin is concentrating on spear work only. This is a rare demonstration of the Scissor gladiator in action, using the crescent-bladed arm guard the guys affectionately call the "pizza-cutter". This weapon was actually made for display purposes, and so has a relatively sharp cutting edge and also barbed hooks. That is why Martin is so wonderfully focused on avoiding it. He is fighting in the style of the Dimachaerus with two swords, so he can use either hand for both attack and block. The scissor arm guard is also good for blocking, and the blade easily rotated to slash from all angles. This was a very interesting match up of styles, really two blades against two without shields, and it is easy to see how a Roman audience could get engrossed by this sort of martial entertainment. 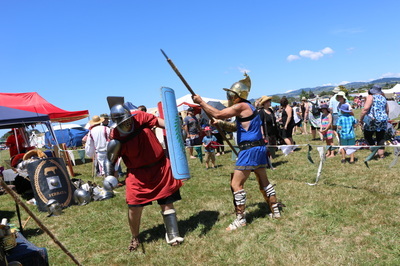 The Murmillo and Hoplomachus fought for the entertainment of Empress Lollipop (Andria Goodliffe, the Medieval Faire organiser). Then followed a rematch of the Ludus Noxii between Idunna the Gladiatrix, Jorkellus of Germania, and Drest the Celt. A surprise attack by a rogue barbarian saw the giant Lucius the Damned spring to the defense by striking the villain dead with a single blow! "And so die all those who dare to defy the Might of Rome!"